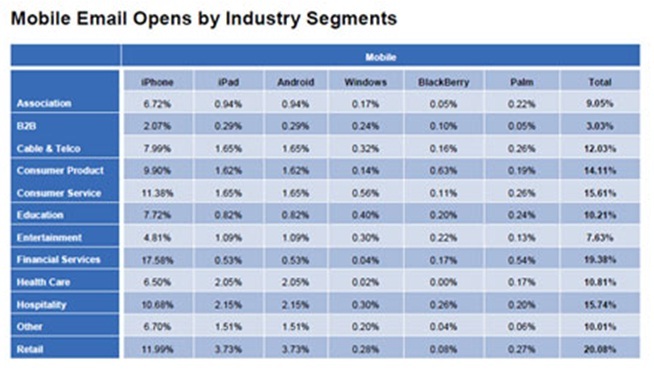 What device is most popular for your recipients to open your emails in? Do you know the answer? Surprisingly 48% of marketers don’t know what percentage of their emails are read via a mobile device and nearly 40% of companies have no strategy for optimising email marketing for mobile devices. Last year there were almost half a billion smartphones shipped globally and over 70 million more smartphones were sold than PCs. Statistics show that mobile email will account for 10-35% of email opens, depending on your target audience, product and email type of recipients opened their emails on a mobile device, based on our client’s statistics we are seeing averages of up to 40% opens on smartphones. 80% of consumers find reading marketing emails on their mobile less easy than on a PC. Knowing where recipients are opening your emails has never been more important. See how your email renders in mobile devices. Your inbox preview tool should show the most popular inbox’s based on your recipient’s opening habits, that way you can prioritise your design based on the top 3-4 inbox’s rather than having to worry about all inbox variations. Send a completely different email to your recipients based on their device type to ensure each recipient gets the best design for their inbox. Knowing what devices your recipients use is a great way to target your database better, use studies like http://bit.ly/hunchinfo which provides statistics on the profiles of smartphone users. For example, iphone users are more likely to have an annual income of $200k and Android users are more likely to be aged 18-34. Combine these statistics with what you learn from your database to profile your recipients and target them more effectively. For example, if you know that iPhone users are more likely to respond to money off emails but android users are more likely to convert after a whitepaper download, then segment and target your data in line with that to optimise conversions.